Any safe crackers or "locksmiths" here? Please note:- It is probably best to only admit to "locksmith" experience on the interweb! Project "Nazi Gold" is in full swing this half term holiday for #1 son (10 years old). I'm currently staying in an old farm house where there is a safe with out a key hidden away upstairs. I don't honestly think there's anything of value in the safe but it is a bit of fun for the children (eldest in particular) as we've been drilling locks. He's now got a rough idea of how locks work because we drilled through the pins and got the tumbler removed. The lock isn't of fantastic quality. Pretty basic. Unfortunately this doesn't release (all of?) the lock bolts. Edges around the door are too thin for a sheet of 60 gram per square meter paper to be pushed in to try and find the position of the lock bolts. ...has anyone got any ideas? I did a project on this about 30 years ago. The safe cracker told me the key was to know the brand of safe you were working on as all of them had their tricks. But once the tricks were known they were easy to defeat. So look it over and see if you can find a brand name and model number. Then do a search for opening that safe. I think what you have is more likely a 'fireproof box' in that it would survive a 90 minute fire. Not that knowing this makes it any easier to get into. And for even more fun you might open the main door only to find several smaller 'safes' built into the interior. Keep us informed. There is no telling what you might uncover. Not much of a safe if the right hand knob is really a fixed one. Two things come to mind. Either the door is a little stuck or chips from drilling may be interfering with the amount of the release bar movement inside. I second the ideal that if you can identify the model look it up. Also of course remember that many even current strong boxes open with the key turning to the left as a deterent as well. I have seen lock tumblers worked over pretty seriously because the individual just assumed it opened to the right. 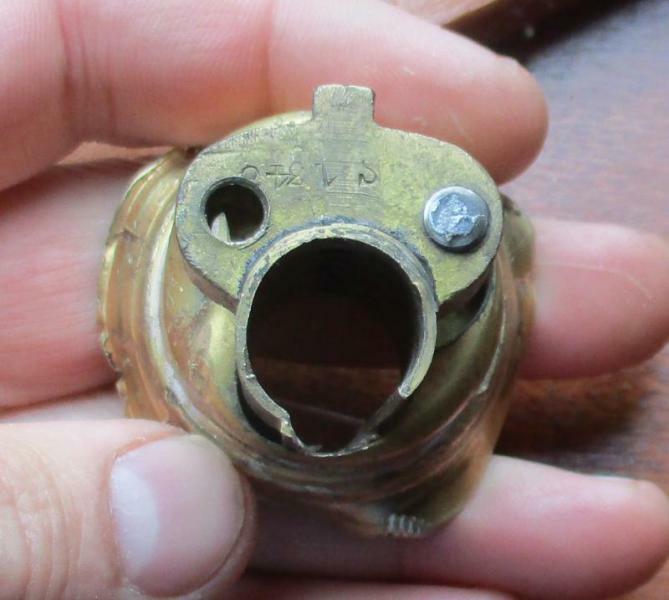 I know almost absolutely nothing about these but the fixed knob is interesting. Last edited by barry12345; 10-19-2015 at 12:11 PM. Not a locksmith, but I've worked in a bank and I'm pretty familiar with how these things work. First of all, safecracking can only succeed if the safe is in working order. Drilling that cylinder was a mistake. It would have been a very easy cylinder to pick, but that opportunity is gone. The problem is that good safes have mechanisms to defend against exactly what you did. 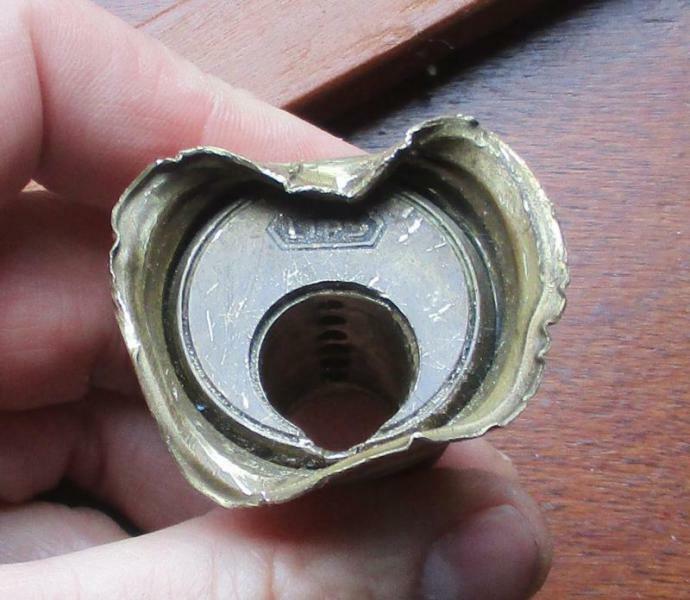 For example, some have a piece of glass or a spring surrounding the lock. 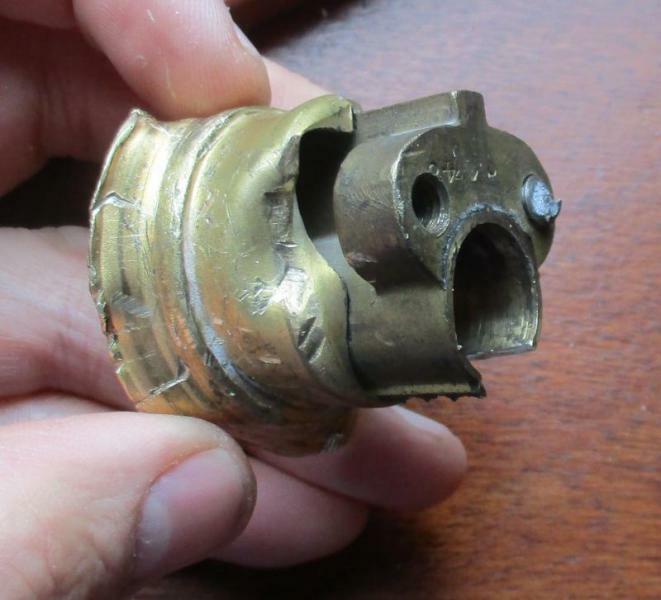 This is an anti-tampering mechanism, which supports a deadbolt. If you remove the lock by force, the spring springs or glass shatters and a deadbolt drops into place, making it impossible to unlock the door. It may be that some similar mechanism is in place here. The reason I say this is that simply turning that slot with a screwdriver should be enough to unbolt the door at this point, yet you are having no luck. 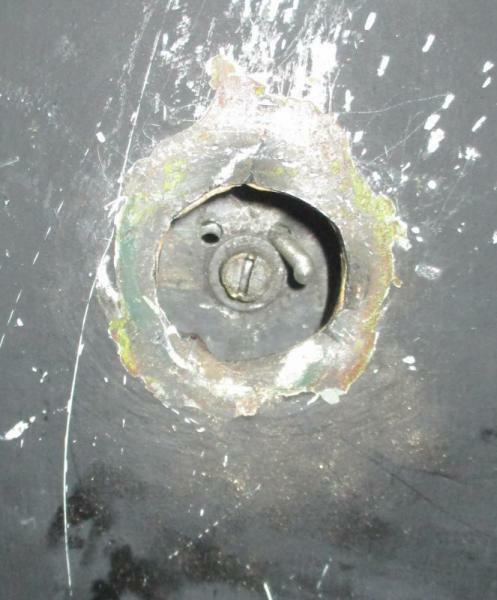 Lock bolts are generally case hardened steel, and the more expensive the safe, the more bolts there will be. So even if you could figure out where they were, you'll find they aren't easily cut. On a big safe, bolts typically engage on more than one side, which means the door will hold even if the hinge is cut. When the timers on a bank vault fail, the entry mechanism is an acetylene torch. No sparks as there are a zillion dollars in there. Actually old papers of interest may be a possibility. How about small dental type mirror to have a look around? At the same time the action appears to be on the other side of the plate that is now showing. There should be a safe cracking forum some place on the net. Even with all the diverse talent on our site. We lack in some areas. Now if it was how to unlock a chasity belt we have some pretty old members. 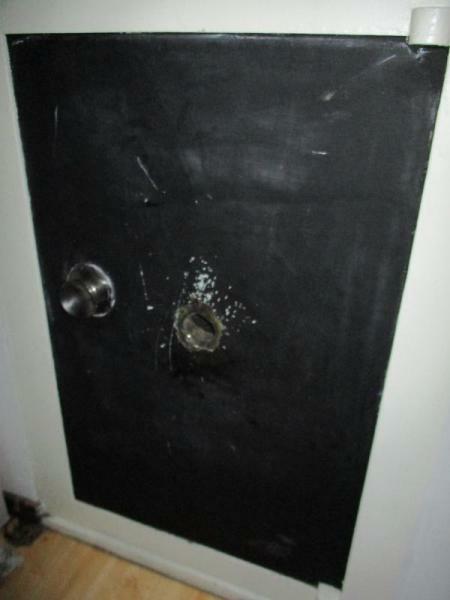 It depends on the quality of the safe, but the door you see may be a thin veneer of steel over the real door. If you peel it, you should find that you are looking at a thick slab of steel, which will pose a tougher challenge than the outer skin. If you knew the brand and model, and had real experience, you could maybe drill through the right spot to lift the bolt. But even that assumes that you haven't triggered a safety mechanism. My experience, only brute force will work at this point. And brute force works better from the sides or the back. If you're interested in knowing how you SHOULD HAVE done this, you should contact TOOOL.ORG, which happens to be a Dutch lockpickers club. Yes, it's a legit hobby, as long as you own the locks! Perhaps this is just a strong door, built into the house. Can you get in from above, below, behind or a side? Thanks for all the comments chaps and sorry for the tardy reaction from me. The safe isn't really a very serious one - the door is in a cupboard but the case pokes through a wall into a kind of stair well that goes up to the attic. The stairs are made for midgets and they incorporate a 180 degree turn. The platform for this turn is on top of the safe. I could probably cut into the back of the safe but then I'd have to fix the stairs. I reckon the mechanism inside is buggered and that's why the door won't open when unlocked. It looks like I'll have to angle grind the hinges off and see if that makes a difference. I really didn't want to do that though as I don't think that's quite so impressive for the children! Remove safe from wall. Use Thermite. That'll show it! I reckon I'll be lucky to find a pair of old socks.